I am very proud to announce a partnership with Trace Elliot and their Elf amplifier. I have been using the ELF live on the National 'Ross the Boss' tour and it was face melting.. 130 watts of clean power in the palm of your hand. Check these tiny power amps out. The NEW Empires of Eden album pre orders are now available - see the store! Architect of Hope - represents the most epic experience yet. With a stellar cast, huge production and killer songs the album is 4th in a collection of impressive releases. 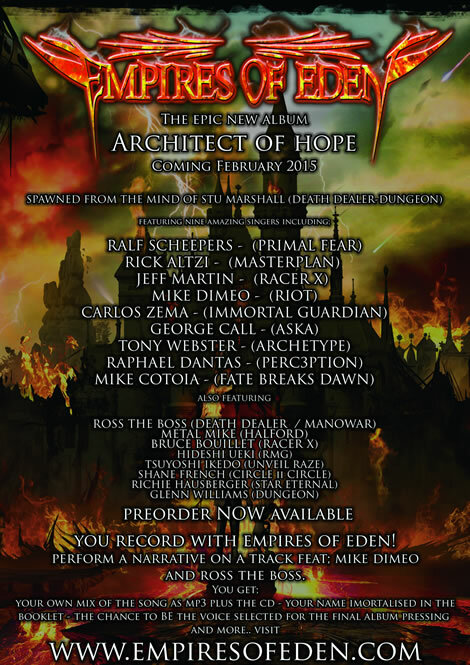 Set for February 2015 release, the preorder offers the chance of recording WITH Ross the Boss, Mike Dimeo & Empires of Eden and you go into the running to be THE voice selected for the album plus much more. An intense amount of updates so I'll work to condense them all here. As many of you know I have been touring with the band Death Dealer recently through Europe and commenced work on the bands second album set for a late 2014 release. 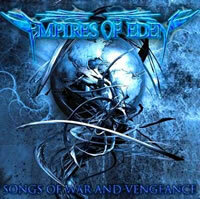 If that wasn't enough, the 4th Empires of Eden album is now in production. An incredible array of talent with a few special guitar guests included, killer new artwork but the always amazing Alex Ruiz. Adding to the list of updates is that all of the back range of material is now again available on Itunes for a very special price. It's a great way to support my music as it's all independently produced for you. So please check out the Death Dealer website that contains all the cool videos and news on upcoming music. I thank you for staying in touch here and will work to let you inside the workings of the new Empires of Eden cd. It's been some time between drinks for updates and for that I can only put down to the blessing of being *that* busy. The Death Dealer trip of the USA wound up last week and we had a total blast... Playing with Sean, Ross, Mike and the mighty Rhino was really an amazing experience, we got on so well and the vibe was really strong. The shows, they were great and the crowd...s who only have heard the material recently so all in all, it's was a success. Some of the highlights include the Mexico show and the help from promoter "Oscar" who went beyond the call of duty to make us welcome. Really, the entire trip was a dream come true. A lot.. Yes, a new Empires of Eden cd slated for next year. I'm in chats for some singers to be involved and will work on this side by side with the next works for Death Dealer. I think Death Dealer certainly represents the heavier side of my writing, perhaps a more direct approach. Thanks for everyone's ongoing support." I have some major updates coming soon so please hold tight. So far the reviews have been coming through and more importantly, thank you to everyone who has written in. I really appreciate it, I even received a handwritten letter - wow, kinda cool. There is some footage of the recent Steve Grimmett tour from the Australian shows we did, so I am considering cutting some clips for the two Empires of Eden tracks we did. I'll keep you posted. As mentioned, in sad news we lost a real supporter and friend of EOE in Tim Buckman. 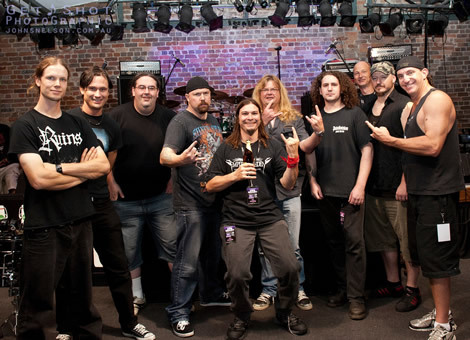 Tim was one of those guys that really supported the scene, he bough alot of stuff simply to help support local acts and was a regular face on the Australian Metal scene. I remember chatting to him at the Canberra Steve Grimmett show and he was a really nice guy. He will be missed from the scene and honestly not forgotten. Tim's story is a great reminder to enjoy the people you have in your life now. Keep checking in with us, there is alot more to come. Firstly a special thank you to everyone who has purchased a pre-release copy of the new album, please check your mail this week. The response has been fantastic, you have all gone along way in supporting Empires of Eden. Yes, actually supporting underground heavy metal music. A few notes as well. The only place you get this cd for the US or Australia is direct through the store. I made the decision after frustrating dealings affected by the declining industry and the standards set by some distributors. Having excellent dealings with Europe and Japanese labels I wasn't prepared to lower the level of product I wanted to get to you. So, for the record, the only place you can get it is direct. Fast international delivery with hand-signed swag is the way I wanted to go. Right now my European management is searching to distributors that can handle what we require for the US. The album was scheduled for an Itunes release on May 31. Itunes have had technical issues with their system (some say it's because the album is far too heavy for their system..) but seriously, it should be live in a few days. Please keep the feedback coming in. Many of you seem to like the new gloss packaging on the digipacks and this was all from some feedback we received so please, keep telling me what you want. Finally, production work has been booked until the end of 2012 with current production on the band Mystery and a few solo projects I'll be mixing for the rest of 2012. "Hey All. In just over two weeks we will see the street release of "Channelling the Infinite". A short shout out to all that have brought presales, thank you for your support and they will be going out in the mail in the week starting the 28th of May. As a special deal, all people who have bought the UDO presale packs will get the album sent digitally to them on May 30 - I can't thank you all enough. This new album is an album that has taken some risks and is a true creative representation of each artist. So far I'm pretty blown away by the response from the reviews as they are mostly hitting 9/10 and 10/10 in some cases. You can never tell with reviews as you have no idea who actually reviewed it or what their actual credentials are. That's another rant for another time. To the important stuff... you guys. Please keep the feedback rolling through and messaged on facebook, I read them all and am happy to respond. Peace and brace yourselves for June 6." Sundays CD showcase and interview with Stu from The Metal Zone is ow up on the web for downloading as a podcast. 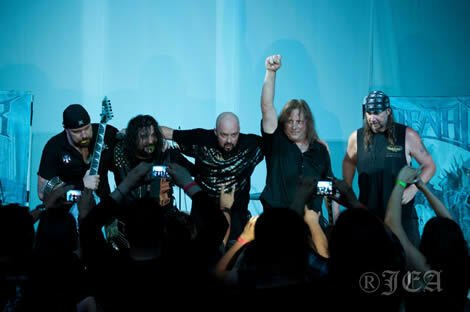 Lots of great tunes by some of the best in traditional and power metal. What a great year so far. I'm really looking forward to hearing from you on your thoughts with the new cd. Yes, the deal is still on, all pre-sale UDO hand signed packs get an Authorised digital copy emailed to you before the official release date. The press seem interested which always amazes me. With a few 9.5/10 reviews and a recent 10/10 I'm a lucky guy. You can see the thoughts on our reviews page. The Cd's are off for pressing, we have the special Digipak versions for all people buying direct from the store, we also include rare signed swag with each pack. The UDO photos came out looking really nice and UDO signed these on the recent "Rev Raptor" tour. The guy is such a legend, it's amazing to have him involved. More announcements, we will not be selling from any stores in Australia, you can only get the cd direct from the webstore or the eBay store. The recent collapse of one of the countries biggest distributors "Aztec Music" has changed the entire game for local heavy metal. Hit us up direct and get next day shipping. This weekend I head up to see my good friend and EOE drummer, Jasix. He lives in an idyllic location about 3 hours north of Sydney. It's a great place and I am looking forward to the beach break. You know the music began for me jamming with Jasix over 20 years ago, so it's always great to hit the highway, blast some tunes and head up to Forster. The rest of 2012.. I'll finish producing the new "Mystery" album in the coming weeks before their world tour in July. June / July will see the debut cd "Songs of War and Vengeance" getting the full current production treatment and re-release later in 2012 / 2013. I might get some time off this year as well - yay. Finally, thank you to every one of you who bought the pre-sale and continue to support. I'll ensure you all have a little extra packed into each parcel instead of a simple cd, we are wracking our brains on how we can give more. Keep the suggestions rolling. 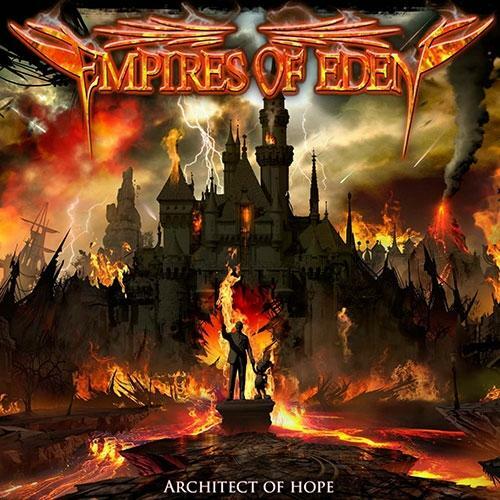 Empires of Eden's Debut CD running out! The last 25 CDs of the debut! Get them before they are all gone! Munich, April 2012. Empires of Eden unleashes “Channelling the Infinite” featuring UDO, Rob Rock, Mike Dimeo and many more! 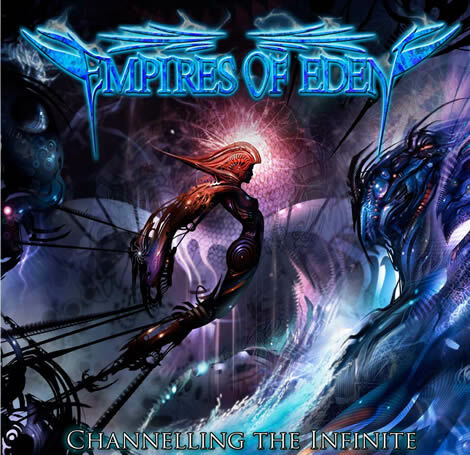 Empires of Eden is proud to announce the release of Channelling the Infinite -- the third album from global recording project Empires of Eden. Japanese release date of June 1 through Rubicon Japan, rest of the world June 6 via Music Buy Mail. Loaded with 12 tracks of brain-blasting power metal, Channelling the Infinite features killer production and powerful, hook-laden music that will appeal to any aficionado. Each song is carefully crafted specifically to suit the singer involved, and designed to best complement their range and style. From there, the vocalists have complete freedom to write the lyrics and melodies, providing a unique insight into what truly inspires these artists. Also available as a limited-edition Digipak that includes bonus tracks for each territory. In addition to the spectacular vocals, face-melting lead breaks and riffs that could take on a nuclear arsenal. 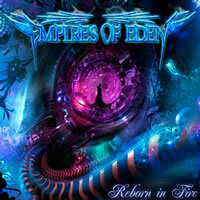 Empires of Eden’s winning formula was proven with the multi-vocalist sophomore release Reborn in Fire receiving worldwide critical acclaim with enthusiastic reviews and a consistent 9/10 average rating. Now, Channelling the Infinite brings us to the threshold of a new chapter in shredding melodic power metal. This album is set to be one of the standout releases of 2012 and must not be missed. Empires of Eden 2012 off to a great start!! It's been a while between updates. I am not the most prolific blog writer, but have the urge to put more thoughts down, so I'll make the effort. The news is, life has been very very busy. Firstly I am one of the luckiest musicians on the planet as I work with singers that inspire me, write amazing music and generally are just great human beings. The new album is due soon with announcements in the next few weeks on the release dates, the amazing featured singers and bonus material that is planned. From a songwriters point of view, to create material for these guys is just the most rewarding experience I can think of musically. Empires of Eden will never be a mainstream financial junket and part of me (the artist) likes it that way with zero obligations to anyone outside of the fan-base. Sure, money is good for everything, but that's not my problem – I work, I don't need to attach a dollar sign to the music. So, an insight into the new album. It's more diverse with more singers, covers more territory lyrically and musically is the most comprehensive album I have worked on. The orchestral parts are really deep and a lot of time has gone into producing the material. The sound production is a step up from Reborn in Fire, which I was very happy with. From the song density point of view, I ended up with 23 completed songs that I have reduced to 13 which was not an easy task. There are some really head crushing tunes on this new album that seem to work again the more melodic pieces. I think you'll find something new each time you listen to it. When I write an album I always consider the total album and, for me it's one piece of work. The best way to listen to the album is to hit it old school, take some time, kick back and listen to it start to finish. If you want the entire vision of the piece, that is the way. But as I know personally, time is not always on our side. An enormous project like this is impossible to achieve on my own, and while the booklet and thanks outline many of the people involved, special mention needs to go to my wing men Jason "Jasix" Manewell and Dan Quinlan. My new management company has made life so easy and I thank Axel @ RockNGrowl for his continued support. And more on the business, I'll be announcing some new label partnerships in the next few weeks (it kills me to hold this stuff in)... Working with the right companies makes all the difference and in this industry.. And.. I won't go on. You get the drift. In closing the blog, I am working very hard to give more bang for buck for this new release, bonus tracks and footage, hand signed posters and promo. With the website, we will be working to make it more interactive, put all the booklets and lyrics online as well. This has all come about from people simply asking, so please anything at all, hit me up at the Empires of Eden Facebook page, we announce all of our news there first. Empires of Eden on the road! What an incredible start to 2012. We have just come off the road for a tour with the amazing Steve Grimmett. These shows covered the entire career of Steve and also featured the new song from the upcoming Empires of Eden cd. Some big shout outs to the band and the entire crew, they worked tirelessly and I know we all feel that we wanted the tour to continue. Some big announcements very soon regarding the new album and some new labels. For a very limited time we have some specials in the online store with hand signed digipacks from Steve Grimmett. Check them out and thank you for the support. 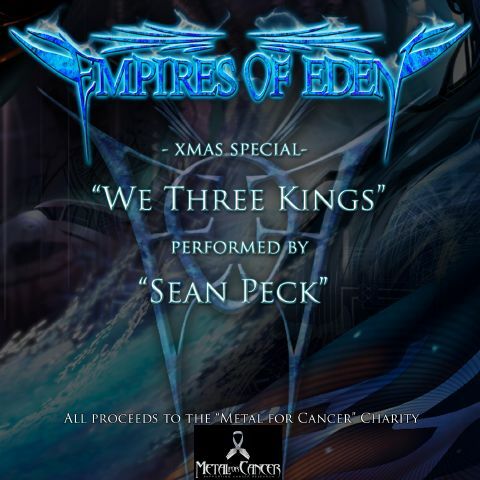 Empires of Eden unleashes an epic Christmas special for 2011 - "We three Kings"
Featuring the vocals of Sean Peck (Cage), this arrangement of the classic Christmas anthem is taken into an epic realm of heavy metal. All proceeds from iTunes will go to the charity "Metal For Cancer" to support cancer research. This is available for a strictly limited time. Empires of Eden's creators Stu Marshall comments:-"This track came into being when I was with Sean in California on a recent trip. It seemed a great way to honour a great song and at the same time offer something towards the fight for Cancer. The usual covers of Christmas carols are fairly comical and we wanted to take it the other way, much heavier and gothic. Working with Sean on the last EOE cd was an incredible experience so it was natural for us to work on this". With the recent success of the release by CAGE - The Supremacy of Steel and the third Empires of Eden album about to commence, this release is a must have for metal fans.